AS: It’s good. In the early days it was tough, because there’s a big shadow you have to operate under. But now, with bands like The Blossoms, Cabbage and ourselves, breaking through and doing decent sized shows, there’s something happening again in the city. JR: There’s loads of venues opening up now…The music scene’s good, but starting out, back in the day, sometimes it was hard to get away from that big, old Madchester scene. If you’re from Manchester because people will automatically think, “I’ll compare them to a Manchester band”. We’ve done a few radio sessions and acoustic stuff, as well as supporting James at Albert Hall at the end of last year. We figured we’d just get it recorded. When we’ve done radio sessions before, me and Aaron normally turn up with an acoustic guitar and now and then we’ve had Jim on acoustic bass so we decided to mic up the drums and use brushes. It really gave the whole thing a different texture. The band records a three-tracks live session for Radio X [Link to Session], including Lunatic, Supernatural, You Opened Up My Heart, and I Saw A Ghost. In an interview, Aaron talks to Kennedy about the band’s progress. We’ve got a strong commitment to memorable melodies…We’re ‘all killer no filler’…I spent a lot of time when we first started out, trying to sound more like everybody else, trying to sound more indy. But I’ve got a reasonable range and as I’ve developed and become more confident in what I’m doing it’s become more honest and truthful. It seems to be working. honest. This is always the nervy bit. Just as tickets are about to go an sale and you wonder if you’re going to get that extra boost. It’s squeaky bum time. But we’re just going to enjoy it…We’re just so grateful to [our fans]. They’ve really driven it. They’ve dragged their mates along to shows or shouted about us on the internet. This gig is as much about them as it is us. Aaron: We’ve had good crowds everywhere. There’s one in particular that the crowd have really got on top of, and bouncing around. Manchester’s probably the first gig we had when we had people on people’s shoulders. The energy in the room has been fantastic…On the TV in particular, it’s got a really strong riff from Kurtis and a very direct chorus. The first few days on the tour the album wasn’t actually out, but you could see that people were getting on it in the moment. People were singing the riff through the tune, and before we came on for the encore. Kurtis: My take was that when we first did the first couple of gigs before the album came out. I thought Supernatural was getting the best reaction. But it’s changed since the album came out. The band release a series of short videos where they talk about each track on Build A Tower. In advance of their Leeds show, Aaron talks to Darren on Proper Sports’ Big Sports Breakfast, about how their previous tour with James came about. It was an amazing opportunity for us. They tweeted one of our tracks that we performed — I Saw A Ghost — acoustically in Manchester Central Library. It was like a guerrilla thing. We just turned up and did it for a YouTube channel. Jim Glennie tweeted via the James account, and we were like ‘Christ, gotta get on to this’. Luckily enough for us they had a new album and tour coming up. There’s a guy who’s supported us for years that’s written about us in Manchester that we knew did their sleeve notes and knew the band. So I manged to get a CD to the band via him. Then a week or so later we got a note from their management offering us 14 dates on their tour. We ended up playing Brixton Academy, Manchester Arena, Liverpool Echo Arena. That was massive for us. It gave us an audience all over the UK. Kurtis: One thing you notice is audience sizes. Going from doing the smaller venues where the odd pockets of people knowing the words, and then getting to the stage where people are all singing it back and chanting ‘Readers’ is a different level. Aaron: The connection with the crowd is incredible now…David Bowie said, “Don’t play to the gallery”. That sticks in my mind: you get down and sing to those that are buzzing at the front, and you see it roll back through the venue. Aaron: A lot of the stuff in the past has been introspective and existential (Kurtis: mean and moody!). I wanted to explore different territory anyway and be a bit more positive anyway. But then Brexit happened, and Trump, and the world seems to be getting very polarized. The trajectory of the planet seems to be completely different. So I thought I was important not to be majorly political, but put a positive message out. Songs like Through The Shadows are about getting through difficult times and the most important thing being about those you love. A more positive message than before, but more universal, and bits of social commentary. Whereas, before it was a bit more about my own insecurities and demons…We’ve sold nearly 2000 pre-orders so far. If we get a decent chart position it leads on to other things. The band are interviewed by Too Many Blogs, talking about their upcoming album, Build A Tower, which will be released on May 4. The Star Wars thing is just a coincidence, we won’t be doing a gig in Jedi robes or anything. We have developed a lot as musicians since Cavalcade, so there is more invention in terms of melody, rhythm, song structure…Some tracks are very personal and explore the feeling of being in love with someone and the delicious fragility of it, the sense that it could disappear before your eyes (‘Supernatural’). Some tracks refer, very specifically, to the external political environment (‘Lunatic’/’On the TV’). Musically, it’s probably more consistent in terms of style, as the album was written in a tighter time-frame than the last album. It’s pretty inventive – hopefully, our existing fans will love it and, hopefully, it continues the work of the previous album (in winning over most people that hear it). Aaron and Jim are interviewed by Reyt Good Magazine, while being driven through Salford, Manchester. They talk about their early days, the support of the band by James, and the changes since they signed. We now have all the machinery established bands had. Before we were doing it all ourselves…we did our best to look around other cities and see what they were doing…if you go to a city where a promoter’s built a reputation, you do get music lovers turning up to see what’s going on. It gves you a chance to get in front of new people. In an interview with Fred Perry Subculture, the Slow Readers Club talk about their favourite music, and share a playlist. James: We always get asked this and it’s really hard to answer because as a band we listen to all sorts of stuff… Some better than others. We’ve been compared to the likes of Depeche Mode and Joy Division. Possibly because our sound is quite dark and has some synths. Aaron also sings in a low range at times. We’re not moaning though, they’re both quality bands. Aaron: Yeah sound wise, it’s a lot of different stuff as Jim says. Lyrically it’s Lennon and Morrissey are probably the biggest influences – I like stuff that’s personal, honest and semi-autobiographical. I won’t lie, it has been difficult for all of us to balance the band, work and home life especially in the last year or so. At times it has been physically and mentally draining. Aside from the logistical challenges of managing to write, rehearse and tour around work, we also do a lot of admin/business stuff as we have no manager, agent or label. That said, we have been rewarded for our hard work with amazing experiences. We ended last year with sold out headline shows in Manchester, London and Dublin. The Ritz in particular felt like a real celebration for us and the fans that have followed us over the years and helped spread the word. We should be releasing something, be it singles or an EP toward the end of the year. We are looking at the start of 2018 for the next album. In terms of what is influencing what we are writing, that feels pretty hard to pin down. Personally, I consume music mainly through listening to 6Music with the occasional bit of Absolute 80s ha ha… Lyrically, much of what I written so far has been quite personal, existential. I will try and broaden things out a little I think. Obviously the political environment, in a post-Brexit, Trump world will have an impact in some way. I think it will be interesting to see how all art forms respond to the political climate in the coming years. The band appear on Sounds TV. It’s been the best year for the band so far. In December last year we were playing Gorilla over the road. And that sold out, but if you had said then in a year’s time we’d be over the road at the Ritz, we wouldn’t have believed it. We’re an unsigned band, so to be able to do this…and it’s just social media’s been great. James support has been great. And the fans. Aaron: There’s men in suits have come up from London. James: We’re writing, we want to do another album as well. 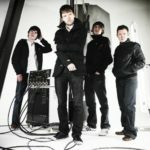 The band are interviewed by a Portuguese music blog where they talk about their sound, touring with James and a few favourites, including a wish to one day play Glastonbury. First and foremost we write and perform great songs with infectious melodies and lyrics that connect and mean something to people. Whatever happens with the band, it is amazing to think that our music has been listened to and enjoyed by people around the world. 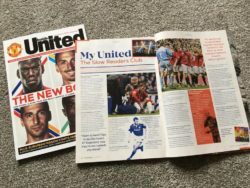 The band are interviewed in Manchester United’s Inside United magazine, where they talk about their love for the team. My dad bangs on about Best, Charlton, and Law — I’d love to see them up close now and compare them to today’s greats. Last year when we played Ramsbottom it felt like the time that things were starting to kick off, and we were getting one or two festivals. And word started spreading. We’re getting evicted from our rehearsal rooms, which doesn’t help. Someone’s bought the building and they’re turning it into a block of flats. We intend to have a month of writing and perform new material at the Ritz. The band are interviewed by Skiddle, where they describe 2016 as “mind-blowing”. We supported James in May on ‘The girl at the end of the world’ tour and played venues up and down the country including Kentish Town Forum, Brixton Academy and Manchester Arena. We were blown away with the support we got from James and their fans. Jim and Saul from the band would watch our set pretty much every night. We had to do an acoustic set for one of the gigs as David our drummer was unavailable. I think Saul could sense we were a bit nervous and surprised us by joining us on stage to play violin on a track of ours called Forever In Your Debt…Manchester will always be the centre of our universe, it always feels great to play Manchester especially recently our show at Gorilla at the end of last year was unreal. We were all really proud of getting that far so the Ritz should be another level again…We are writing in the run up to the Ritz so should have a new track or two, we will also be writing more in the new year. I guess we will tour again once we have a bulk of new stuff.